There are many ways in which the thing I am trying in vain to say may be tried in vain to be said. 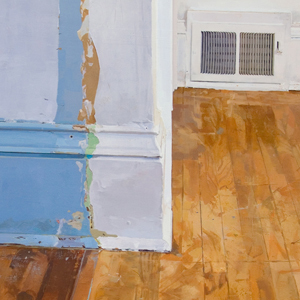 To make one's own appreciation understood and compelling to another is extremely difficult, especially when that appreciation falls on subjects as stark and plain as the worn surfaces, static objects and spare spaces depicted in my paintings. Painting has a long history of making the banal compelling, but I hesitate to claim this as my sole purpose. My motivation to transform into paint what I am drawn to visually stems from the desire to offer something new, something tangible only in the form of a painting. It is important that these images are constructed with this material, not simply to put emphasis on a subject that might otherwise be overlooked, but for the discovery and possibilities of the medium used to construct the image. "The medium is the message," as Marshall McLuhan famously wrote. It is through a massive accumulation of glances, assembled moments and chance occurrences in my efforts to describe these subjects in paint that the viewer becomes compelled to reach the contemplative state I am trying to induce. 7th International Drawing Annual, Manifest Gallery, Cincinnati, Ohio, page 84. 2nd International Painting Annual, Manifest Gallery, Cincinnati, Ohio, pages, 37,38,39. 1st International Painting Annual, Manifest Gallery, Cincinnati, Ohio, page 82. 5th International Drawing Annual, Manifest Gallery, Cincinnati, Ohio, pages, 74,75.